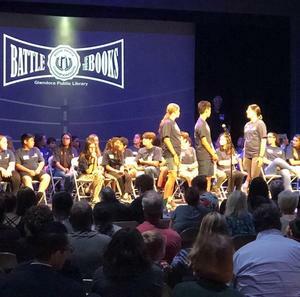 On September 18th, Foothill Christian School hosted the Glendora Public Library's annual "Battle of the Books" testing students' detailed knowledge of 3 books. There were 24 teams made up of students from Glendora USD, Charter Oak, Bonita, Claremont, Foothill Christian, St. Dorothy, and home schools. The winning team was Luke Enriquez, Melody Miner, and Gigi Calicchia, all 9th graders at GHS! Well done Tartans! !